An Oregon man who was snowed into his vehicle for five days reportedly said he survived on packets of taco sauce. Jeremy R. Taylor left his Bend, Oregon, house for gas with his dog on Sunday, Feb. 24, and police put out a missing person alert the following Wednesday after he hadn’t returned home, CNN reported. He and his dog were reportedly found Friday inside their snowed-in SUV by a snowmobiler. Taylor told local deputies he got stuck the previous Sunday, decided to spend the night in his vehicle and try again Monday, but the snow had gotten deeper and he couldn’t make the trek home even on foot, the Deschutes County Sheriff’s Office said in a Facebook post. “Jeremy stayed warm over the next four days by periodically starting his vehicle and used a few taco sauce packets he had as food,” the sheriff’s office post said, in part. 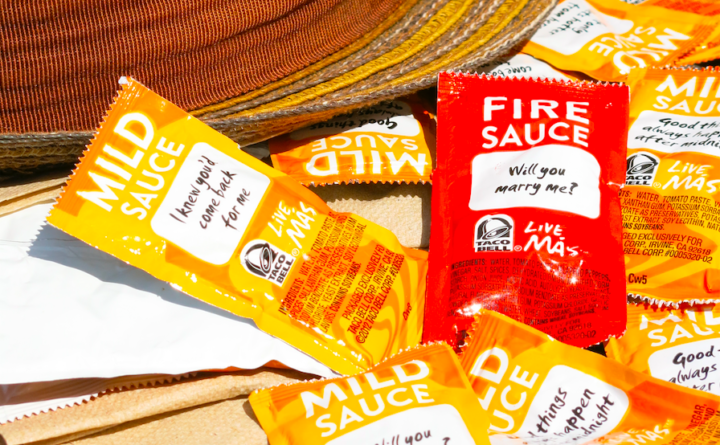 “Taco Bell fire sauce saves lives,” Taylor said in a Facebook response of his own, the Huffington Post reported. As tasty as taco sauce is, the National Weather Service advises drivers in snowy states — like Maine — to keep a winter car survival kit in their vehicles. Among the items it suggests keeping in the kit are nonperishable food, water, sand or kitty litter for tire traction, extra blankets and an extra cellphone charger. Featured image (cropped) by torbakhopper used under Creative Commons license 2.0.